If you have your child's iOS device monitored by using both the iMazing and Bark Desktop App, you can now upgrade to the new Bark Desktop App 5.0 and eliminate the need for the iMazing program altogether! Backups will occur automatically on Windows! The program is set to run an automatic backup of the device every 6 hours over WiFi, as long as your child's iOS device is home and connected to the same WiFi as the computer. Our self-learning algorithm is still analyzing the iOS device texts (including some deleted ones! ), web browsing, and saved photos/videos for worrisome content through backups performed by the Bark Desktop App. If you miss a day or a few due to a vacation or another busy time, rest assured we'll catch that old activity whenever you run a backup again (up to weeks back!). You can also 'force a backup' to occur at your convenience! See here for more information. The second one asks if you'd like to delete old backups. We would like to start fresh, so select Yes or Delete. Note If you would like to delete old iMazing backup files manually or have already uninstalled iMazing without deleting old backup files, see here for how to do so. To do so, click the ^ on your bottom taskbar, right-click the Bark dog, click Help, and select Check for Updates. See here for more information! You will see the following screen, and you will want to click Check for New Devices. The backup will begin after selecting your child's name on the drop-down menu. After some time, you'll see a percentage indicator in small text below. This one may take the longest out of all the backups you perform. Subsequent backups will automatically delete the old backups, saving you storage space. Run into an error here? This could have happened if your internet cut out during the upload. If the internet is not the issue, try changing your child's iOS device to airplane mode and trying the backup again. If it persists, reach out to Bark Support! We recommend having the computer on and connected to the internet during a 12 hour window of the day so that you get more frequent analyses of your children's iOS devices. To do this, go to your System Settings > Power Options, and set what works best for you and your family. For more information and suggestions on this, check out this article. 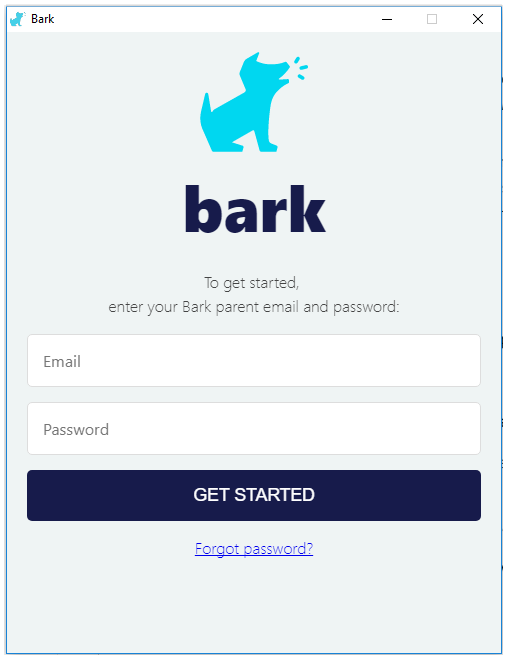 When you see the green check mark, your child's device is now connected to Bark and being monitored whenever your child is home and connected to the same WiFi as the computer. 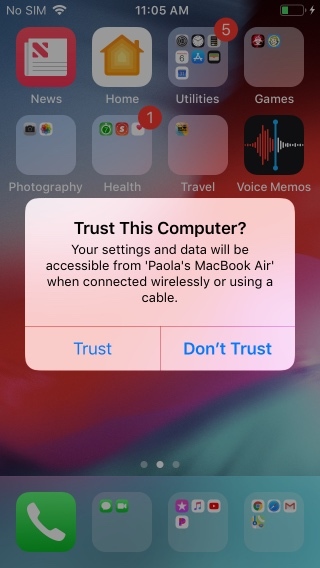 You will begin receiving notifications about potential issues from the Apple device's texts (including most deleted ones! ), saved photo/video, and web browsing. We understand life gets in the way sometimes, so if you miss a day or a few due to a vacation or another busy time, rest assured we'll catch that old activity whenever you run a backup again (up to weeks back!). You can also 'force a backup' to occur at your convenience! See below for more information. 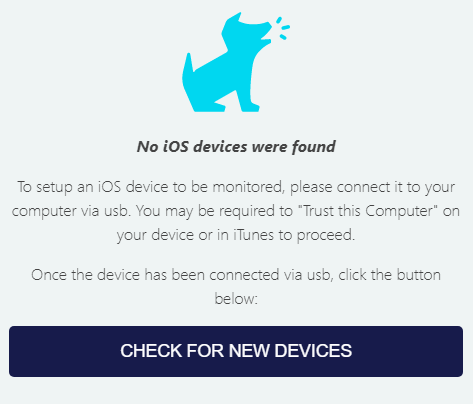 How do I keep iOS device monitoring up-to-date? Have your computer powered on and awake for hours at a time, so that it has the opportunity to run the backups over WiFi when your child is home and connected to the same WiFi. For recommendations for doing this on your Windows computer see here! Click "Update" whenever prompted by the Bark Desktop program that a new update is available. Restart your computer to properly apply the update. See here for more information. Unsure if your backups have been received by Bark? Not tech-savvy or run into a weird error and need help? No worries! Bark Support is committed to helping every step of the way. Please email help@bark.us or schedule a call with us! Note If the Bark Desktop App opens as a blank white window, you may have to update your Apple Drivers. The easiest way to do so is by downloading iTunes. Note If you see the following message, you can uninstall iMazing.